Yesterday’s post about Social Security numbers brought in a flurry of information tidbits and additional questions… all of which are too good to leave in the comments section. Second, from Israel Pickholtz, the tidbit that the Social Security Bulletin published a brief explanation of what the numbers meant — with a useful chart of what the first three digits used to mean — in 1982.2 He published a link to it on his blog recently. And then the questions… mostly from a new-found cousin-by-marriage Ruth Cattles Cottrell,3 who is clearly having some trouble finding one or more Social Security records that she’d like to find — and might expect to find. The dates and categories set out above pretty much explain it. The system was intended to cover employees under age 64, and Ruth’s guy was older than that. Chances are pretty good, unless he held regular paid employment as an older man and decided to register anyway, that he wasn’t covered, never received benefits — and never got any SSN. Great question — and one for which I have no clue as to the answer. Ancestry‘s source information is pretty sketchy, simply citing as original data “Social Security Applications and Claims, 1936-2007.” There are clearly fewer overall records here than in the Social Security Death Index (SSDI) — roughly 49 million, or about half the number in the SSDI — but then there are also some folks in this index who aren’t in the SSDI. So it’s worth checking both — and hoping for more down the road. Image: Modified from Wikimedia Commons. The first day the Applications and Claims database was released, I found a relative’s record which showed all her name changes through a career which included five husbands. She recorded her name change every time, so I also have these gentlemen in chronological order, even if the name change wasn’t made immediately after the wedding. Found the surname of Husband #3, which had never turned up anywhere else (and isn’t turning up in other records even with his surname). By all means check this database! So, I still don’t understand. Will the SSA provide copies of other original records, such as a death claim, name change, life claims, etc., or is it just limited to the original application? With this new Ancestry database, it’s just an index, so I would like to see the original records, know what i mean? The Freedom of Information Act web page at the Social Security Administration suggests that you can ask for more than just the SS-5 (application for a SSN) but that it will cost you: $16 an hour for some searches, $33 an hour for those that require a higher-level government employee, and $59 an hour once a supervisor has to get involved. Wow. Thanks for the info Judy. You’re the best. Here’s another instance of every rule having an exception. I grew up in Saudi Arabia, where my father worked for the oil company. 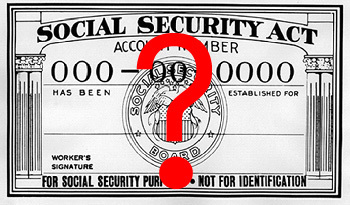 In the mid-1960s, I had to get an SSN because I had a bank account. The SSN I was issued started with a 3-digit number that’s assigned to California–I’m not sure why. I’ve never lived in California, so it’s possible that some future genealogist will be frustrated trying to locate me there! Well, that certainly answers my questions. There went the last best chance to figure out the parents of my orphaned great grandfather, Thomas Cameron Childress, who certainly knew the names of his parents but never shared the fact with his children before dying in 1947. And while I’m throwing this tantrum, let me rain down a curse on my other ancestors who were southern farmers, housewives and small independent business owners and that pretty much covers all of them. They weren’t Richard Childress and Ella A. Treadwell? A recent DNA match and a couple of family stories would indicate that but at this point it’s still speculation. I didn’t even know what Alabama Childress family he might descend from until I tested my mother’s first cousin who had a 23andme match with someone who actually knew which family in Alabama she descended from. I have never found a document that actually says that Richard and Ella are his parents. However, adding Richard and Ella to my Ancestry tree has garnered additional AncestryDNA matches to that line. What everyone seems to be forgetting is that this database only includes “Applications and Claims.” If Granpa never applied for Social Security benefits, or filed a claim for disability benefits, he won’t be in that database. At least, that’s the way I understand it. That’s not the way I read it and not what I’m seeing: lots of people will be in this database without ever having applied for or received benefits — it includes original applications and many name changes. My grandfather, whom our family told me did not get benefits (he was a self-employed tradesman b. abt 1876-8, d. 1952), nor did his surviving widow– is, I’m fairly confident from the index info, in this database! Wahoo! He is not in the SSDI and I had put requesting SS-5 on back burner, thinking it wasn’t best use of $29. It is now! I think he may have applied, received SSN around cutoff age, but didn’t end up having enough eligible employment near the end of his life to receive benefits. Best part: parents’ names are a close match to the only other form I have on which he listed them (he was secretive; long story. 🙂 ) Original *should* verify it’s him by address–I know where he was living at that time–and his signature & possibly employer/occupation. DO check this source even if your person is not in SSDI and/or get any benefits. You may end up doing a genealogy “happy dance” with me! Thanks, Judy! My understanding of the death index is that it only includes people who died after the system was computerized in the early 1960s – unless there was a claim by a surviving spouse who died after that time. Some years ago I asked for an SS file for someone who had died about two months previously and was told that the file had been destroyed shortly after the person’s death. Or perhaps someone just didn’t want to look for it. I did look at ancestry’s new SS applications file and found none of the people who might have been expected to be on it. There are two different indexes, Susan: the Social Security Death Index (SSDI) and this new index that Ancestry has — the “U.S., Social Security Applications and Claims Index, 1936-2007.” Each clearly has different criteria for inclusion, and apparently neither of them covers everyone, not even everyone who had a social security number.